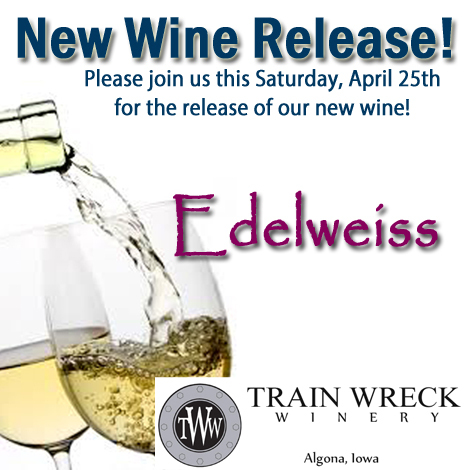 Train Wreck Winery is pleased to announce the release of a brand new wine – a delicious white wine that we’re sure you’re going to love. 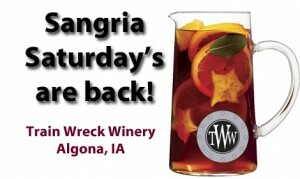 Sangria Saturdays are back at Train Wreck Winery beginning in April! Make an afternoon of it at Train Wreck Winery – bring your friends, sip some delicious sangria, and have some fun! 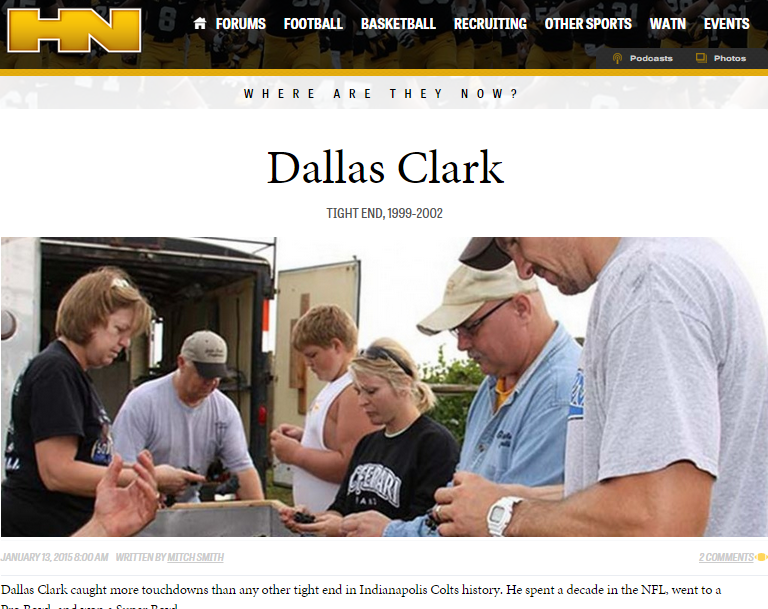 Train Wreck Winery Owner, Dallas Clark, was recently featured in a “where are they now?” story in Hawkeye Nation. Read more the entire story. Winemaker Blog – Baco Noir! 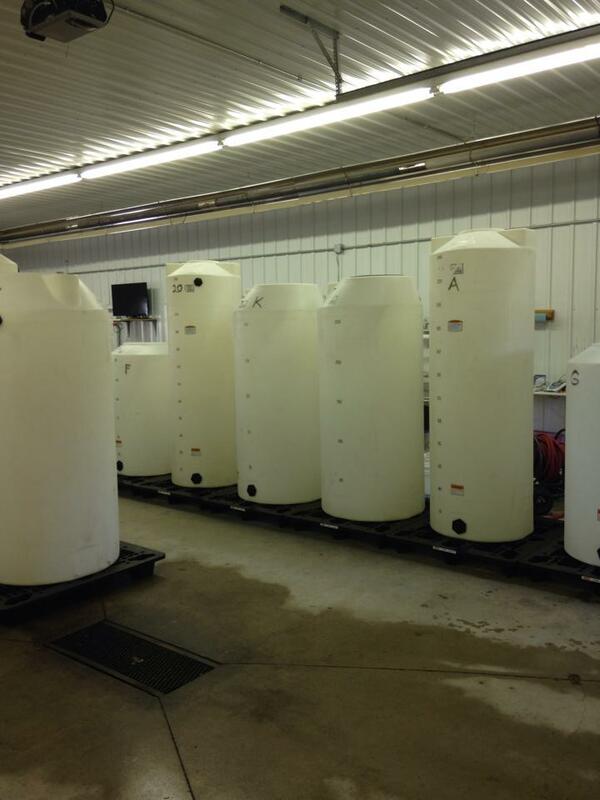 Empty tanks ready for fresh Cranberry juice, Baco Noir (red wine) and Concord (red wine) juice. We received a juice shipment on Monday. Walker’s Wine Juice from Forestville, NY, arrived with tanks containing 550 gallons each of Cranberry juice, Baco Noir (red wine) grape juice and Concord (red wine) grape juice. The Walker family is a farm family that grows many acres of fruit, and buys/presses many tons of fruit each year. They cold-store this juice until needed by winemakers like me. There are several benefits to processing juice vs. grapes. It requires less labor, as I received the juice on Monday by myself, rather than having 4 people handling grapes. It was much faster, as I tanked 1650 gallons of juice in about the time we could process 90 gallons from grapes. I can get juice that I can’t buy locally. And I can make wine during the year other than during the frantic grape harvest season, making better use of our facilities. I split each of these juices into 3 tanks, total of 9 tanks, for fermentation. A foamy head develops during fermentation, so tanks can’t be completely full. I added sulfites to the juice to protect it against wild yeast that could gain a foothold before my wine yeast get started. I then let the juice rest for a day to warm up, as it was approximately 36 degrees on arrival, much too cold for our yeast. Tuesday I circulated the juice in each tank with a pump to ensure that the sulfites were well distributed. I added some cane sugar to the Baco juice to up the alcohol that will result. Towards the end of the day the juice had warmed to about 54 degrees, so I prepared yeast propagations for each tank. I pitched these into the tanks Tuesday evening, and now I’ll await the start of fermentation in the tanks. 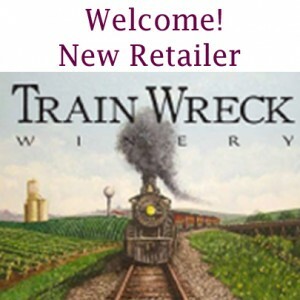 Train Wreck Winery welcomes The Painted Lady in Lansing, IA to our list of vendors. This is a cool shop with the railroad running by the front door and the Mississippi passing under the deck in back. Stop in for one of their Big Train smoothies and take a Big Bag of Train Wreck home! Winemaker Blog – When to Harvest? HARVEST PARAMETERS. We have lots of grapes schedule to arrive this weekend at Train Wreck Winery. 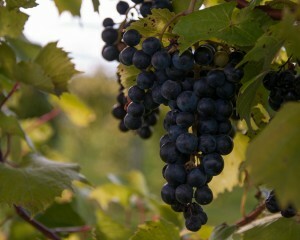 We will be harvesting our own Marquette, and we will be getting Frontenac and Frontenac Gris grapes from several growers. How do we know when the grapes are ready to harvest? Science and experience. In a perfect world, there would arrive a moment when the sugar and acids were in just the right amounts. That seldom happens. So we pull sample clusters from the vineyard, trying to get a representative mix of clusters. 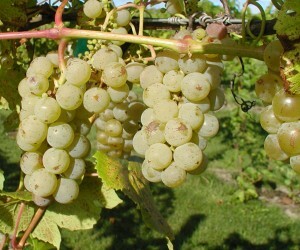 Clusters that are exposed to the sun will ripen faster than those that may be shaded. We press the juice out of this sample, and test for pH, sugar %(called “brix”) and sometimes other things such as titratable acidity(TA) or yeast assimilable nitrogen (YAN). Because of variablilities of rain, sun and growing degree days, the numbers we measure in the lab are seldom exactly what we are aiming for. And even though our lab tests might dictate waiting, we may see degradation in the quality of the grapes in the vineyard, or maybe we have to pick this weekend because next week is the big game and nobody will want to help pick. So we pick when the science, our experience, and our gut tells us the time is right. Steve has been busy in the cellar and around the state over the past week. Here are his notes from this period. Enjoy! FERMENTATION. On Friday Aug 29th we inspected the juice. Very little activity is present. This is due to the temp of the juice. Going from the freezer, thru the destemmer, and thru the press, the resulting juice was in the low 40’s. By Thursday it had raised to 52 degrees. Today it is 56 degrees, so the juice is still a little chilly for our yeast, for which the optimal temp is 59-65 degrees. We’re keeping the facility chilly (60 degrees) to encourage this slow warm up. We want a slow, cool fermentation to encourage the properties we want in the finished wine. We now have Brianna, Edelweiss and St Pepin juice fermenting in the winery. We are monitoring the Brix in the wine to make sure the fermentation is going smoothly. Once about a third of the sugar has been converted to alcohol, we add nutrients to the fermenter. The product we use is Fermaid-K. This product provides yeast nutrients, particularly nitrogen, to the yeast cells to ensure they don’t stress from lack of essential foods. Other stressers include high alcohol and heat. We treat the latter by keeping the volumes low and the winery cool. As we’re shooting for an alcohol level of 11%, the fermentation should be complete before high alcohol becomes a problem. This year many growers are reporting sour rot in their Brianna grapes. 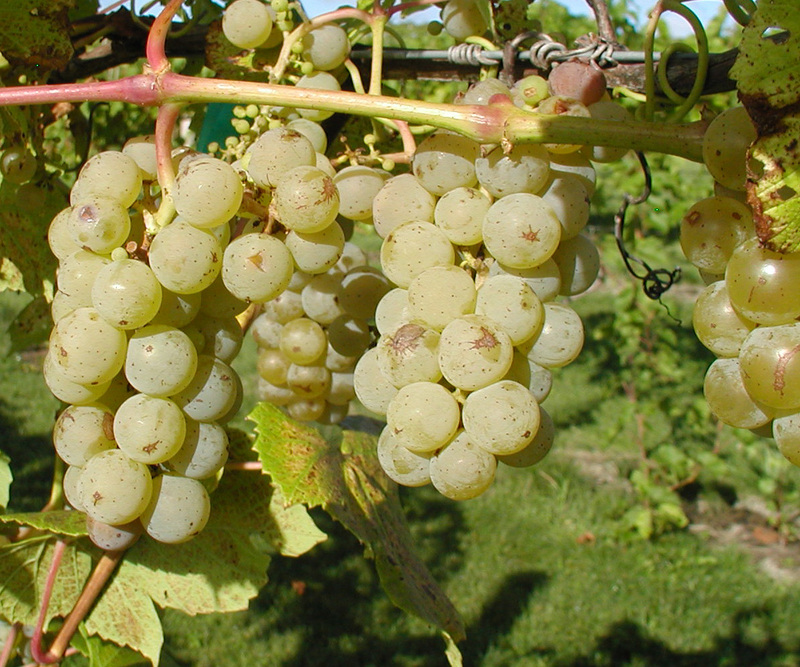 Unlike other fungi that we prevent by proactive means, sour rot occurs when grapes are damaged. The skin on grapes can be broken by any number of things: insects; hail; cracks caused by drought/too much rain; birds. Once the skin is compromised, sour rot sets in. At that point there is little to be done except to sort the clusters at harvest and get the grapes processed as quickly as possible. The main concern is the amount of Volatile Acidity (VA) in the juice/wine. VA is basically vinegar, and can cause flavor issues. There is a federal limit of 1.2 grams/liter of VA. So I sent juice samples off to the Iowa Grape and Wine Industry Institute for testing, and our VA is well within the limits. Snuck away from a function at the Depot last night and added Fermaid-K to two tanks of Brianna. The sugar had reached about 2/3 its original amount. Fermentation additions have to be done at certain points of the process, and cannot be delayed. Checking the ferms this morning for temperature and any off-odors that may have developed. We’re off to a wedding in the Quad Cities this evening, so won’t be able to check them again until noon on Saturday. I think we may be getting grapes in tomorrow, too. WINE MAKING. We pumped all the juice into a single tank. We measured our pH (3.05), our sugar (15.5) and our free sulfites (0 ppm). I added sulfites to the grapes in the cooler for two reasons: to prevent wild yeast from starting fermentation; and to prevent oxidation (browning) of the juice. After processing there was 0 ppm(parts per million) free sulfite, so I added enough to have 50 ppm in the juice. 50 ppm is enough to inhibit wild yeast, but not our special wine yeast. I also added sugar to increase the Brix of the must to about 20%. We will want about 11% alcohol in this wine. A rough rule of thumb is that the final alcohol percent in the wine is 55% of the starting sugar level. So 20 X .55 is 11. After sugar addition, we let the juice settle overnight. The frothy bubbles tell us the yeast is ready to “pitch” into the juice. PITCHING THE YEAST. We started Thursday morning by making our yeast propogation. Starting with warm (100 degree) water, we first added a product called Go Ferm. This product contains nutrients and micro nutrients that help the yeast fully rehydrate and get off to a good start. We then add the wine yeast. The yeast we are using for this wine is called Aroma White, manufactured by the Enartis company. This yeast has the characteristics we’re looking for in making a young, aromatic wine fermented at low temperatures. After about 20 minutes the yeast prop begins to bubble as the yeast begin to reproduce. Over the next couple hours we introduced small amounts of the juice to acclimatize the yeast. Meanwhile we verified our 20% sugar, and rechecked the free sulfites (SO2). Instead of 50, the result was 16ppm. This is because a large portion of the SO2 we added had become “bound” to other substances while performing it’s protective role. So we added SO2 again to achieve our desired 50ppm. We then pumped the juice to another tank, leaving as much sediment behind as possible. We then split the juice into two tanks, and pitched the yeast into each. The reason for using two tanks is twofold: at peak fermentation the wine will develop a great deal of foam, and we need head space to prevent overflow; and heat is developed during fermentation, so the smaller amount in each tank will help the heat dissipate. Once the yeast is pitched we enter the “lag phase”. 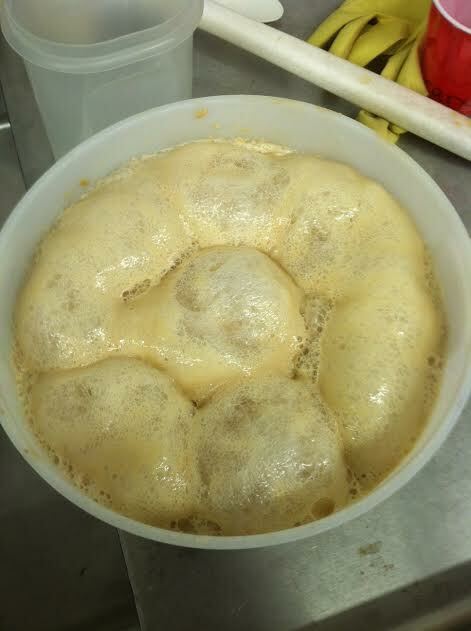 During this period the yeast are reproducing like teenagers. At some point the activity will become noticeable, as the yeast cells approach 10-12 million yeast cells per millileter. Then the lag phase will be over, and full fermentation occurs. Train Wreck Winery will close at 4:00 Friday, September 5, 2014. We will be open Saturday normal hours from 12:00-7:00 P.M.